This Week’s Bits & Bites: Best of 2012, Being Better in 2013, Charley Frickin’ Harper Glasses! Hello there! Here’s some of the mostly-random stuff that’s been on my mind this week. So many of my favorite blogs featured “best of” 2012 posts, and I had so much fun reading them. It’s so interesting to see what both bloggers and readers tend to love the most. 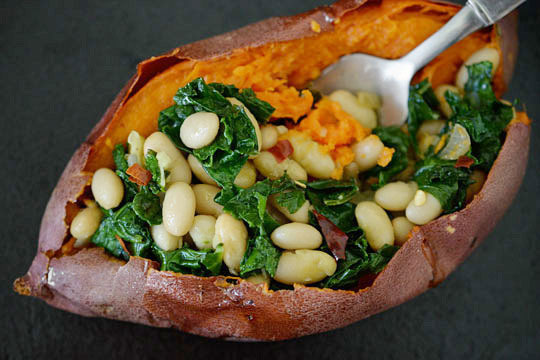 Selfishly, What I Ate This Week: 2012 Favorites from Oh My Veggies was my fave. Kiersten writes a fabulous, consistently drool-worthy weekly series entitled “What I Ate This Week.” And she eats some amazing-looking stuff. So why did I say “selfishly?” Because she included my very own creamy pumpkin-baked rigatoni in her list! Yay! (Seriously though – check this one out for all the other amazing-looking recipes that made the cut). I also loved this piece from Aimee of Simple Bites. Though I had to avert my eyes, ears, and everything else when she shared candidly about harvesting her own chickens, I adored just about everything else Aimee and her contributors shared this year. This recap reads like an uplifting journal entry and glows with positivity (especially that bit about the food blogger community at the end). As far as Kitchen Treaty goes, I opted not to post a best-of list this year. For one, this blog has only been around since March 2012 – and the black-and-white, analytical side of me couldn’t get over the fact that I didn’t have an entire year of data to pull from. But if I had to share the top five most popular recipes, off the top of my head I’d say that white strawberry-lemon sangria, white pizza grilled cheese, the best macaroni and cheese ever, fluffy Nutella buttercream, and cold-brewed iced coffee took the top spots. All top picks of mine personally, too! This past couple of weeks, I’ve gone on a bit of a bender collecting a bunch of whole-food, real-life, calorie-cutting (or calorie-burning) ideas that, when done consistently for one year, should each result in a five-pound weight loss. My thinking is this: One pound is worth 3,500 calories. So five pounds is worth 17,500 calories. Over the course of the year, each five pounds boils down to about 50 calories per day. And implementing several ideas that have me cutting/burning 50 calories per day, to me, isn’t nearly as intimidating (or potentially unhealthy) as, say, a full-on fasting detox, right? Small changes, slow (and realistic) progress, hopefully big rewards. Grilled Caesar salad from A Little Kitchen. Looks divine, and no anchovies. Woo woo. Farro risotto from Saveur magazine. Love this. Vegetable party spaghetti with warm thyme-garlic olive oil from Picky Palate. So colorful it calls for a party! Another terrific-looking pasta dish from Two Peas and Their Pod: spaghetti with sundried tomatoes and spinach. 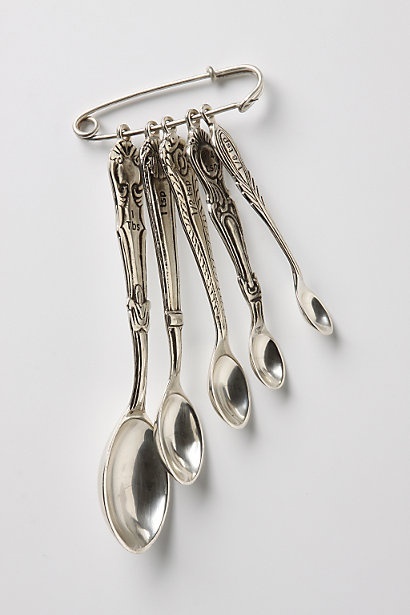 Just, these measuring spoons from Anthropologie. Love. And since I’m jonesing, this calendar by Rifle. Want, want. Um, what? 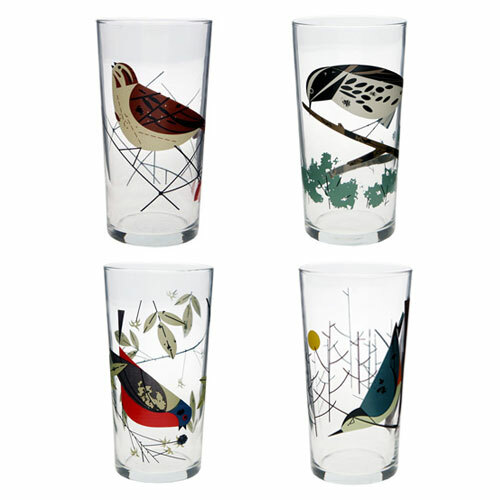 Fishs Eddy sells Charley Harper glasses?! My life may just be complete. That’s all I’ve got. Hope you’re having a happy weekend! 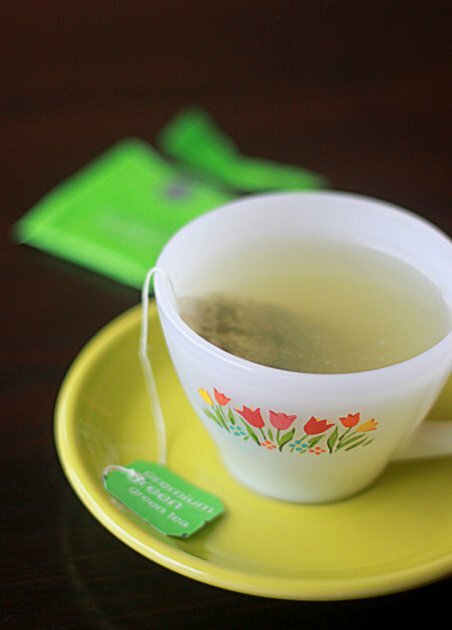 Thanks for the link-up to my post and I am in love with that shot of the tea in that pretty mug! Thanks for the mention! 😀 I’m trying to be healthier this year too. And hey, I already drink green tea, so I’m off to a good start, right? I’m totally coveting your adorable tea cup. And those glasses! Me too! My goal in 2013 is to be healthier. I’m trying to focus on getting proper sleep and eat meals consistently. I have a bad habit of skipping meals and then eating too much at others. Once I get the eating + sleeping under control, I’m going to tackle working out. I wish I loved working out! *hah* Maybe one day! ?